BCDB Rating: 4.5/5 Stars from 9 users. This page has been viewed 37 times this month, and 4096 times total. Cartoon Characters: Opus the Penguin, Bill the Cat, Truffles, Ducks, Chicken, Ronald-Ann, Santa Claus, Milquetoast the Cockroach, Kiwi. Opus the Penguin, among his other problems, always feels inadequate by his being "aerodynamically impaired." Together with his brain-fried cohort Bill the Cat, he tries doggedly to overcome that weakness, all without success. Wrestling with an unfulfilled wish to soar through the air like any other self-respecting bird, Opus turns for sympathy to his scroungy pals and his animal "support group"- a lovelorn kiwi, a fashion-minded cockroach, and a cranky piglet who thinks that he's a rhino. 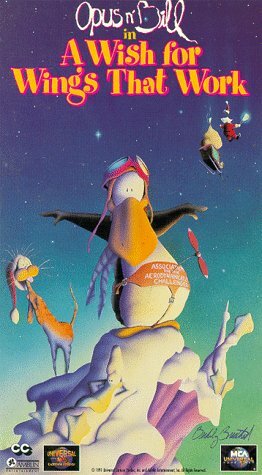 When that doesn't help, the plucky penguin decides that there's only one person who can make his aeronautic dream come true: Father Christmas. But when Ol' St. Nick finds himself in hot water on December 24, the fate of Christmas itself suddenly depends on the kind of heroism that only comes in a penguin-sized package!Only on Christmas Eve does Opus learn what worth his natural abilities are. Do you have anything to add to this page? Have we made any mistakes... or do you have any additional information about A Wish For Wings That Work? If so, we would love to hear from you. Please send us a quick note with your additions or corrections to this page, and we will make the corrections as soon as possible! 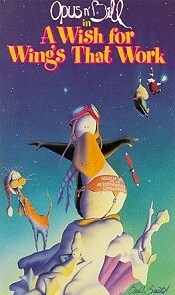 Do you love A Wish For Wings That Work, or do you think it is the worst cartoon ever? Let us know what you think! Surely you have an opinion... so share what you think. Take a minute and post your own comments about this cartoon here. A Wish For Wings That Work by Big Cartoon DataBase is licensed under a Creative Commons Attribution-NonCommercial-ShareAlike 4.0 International License.